Meristem have greened up several of their offices including their head office in Fitzrovia. between humans, nature and natural processes, which more recently has been recognised as a key consideration when designing and developing workspaces. 4 Hammersmith Parklets Launched this week! This week we launched 4 of our new community Parklets on Hammersmith Grove, 2 of them even had 3m high Green Pergolas. Combining trees and plants with wooden benches and cycle parking, these 4 10m by 2.5m Parklets are designed to encourage cycling, improve air quality and make the street greener for residents, shoppers and businesses. They’re also part of a borough-wide plan to support and encourage biodiversity in the area. Northbank Bid organised a Cleaner Streets Day last Wednesday, the event was used to promote a cleaner route to work using John Adam Street which is parallel to the Strand. It may not have as many shops as the Strand but it certainly is a lot cleaner with less traffic and far less pollution. 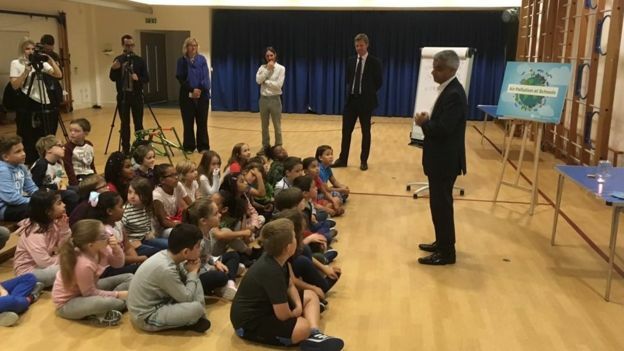 As part of Sadiq Khan’s plans to improve pollution 50 ‘air quality audits’ for primary schools in the worst polluted areas in London have taken place to identify hard-hitting measures to protect the children from toxic air. During the Easter break Meristem installed Green Screens at Prior Weston Primary School in the City of London, this was the 1st school to be audited. This project was successfully funded by City of London's City Air Project and the construction company Taylor Wimpey. We planted 40 ivy screens (1.2mx1.8m) along the fence of the playground, the planters were built on site from sleepers and lined with a membrane, creating vast amount of seating. The screen covered a total of 46m and a height of 2m which has refreshed the school playground, bringing green to a grey space. The second school we completed during the Easter Break was St Peter’s Eaton Square C. of E. Primary School located in an area of London that has high levels of air pollution from the volume of traffic in and around Victoria mainline station and Victoria National Bus station. The project was funded by the Mayor’s Greener City Fund and Grosvenor Estates. We planted a series of ivy screens 2.3m high in 7 custom made planters along the rear wall between the busy road and the playground. Rosemary, mint, thyme and sage were planted at the base of the ivy screens. 5 olive trees were also planted with vinca minor and grasses, with a bench between 2 of them to create more seating. The school also hopes to incorporate the green screen and planting into the children’s basic education about caring for the planet, including learning about the herbs and how to care for the all the plants. The school said they "want the children to become the adults who can help reduce the harmful impact of climate change and create a better London and world”. ‘The ivy screen led to a decrease in the pollution concentrations on the playground side of the screen by up to 36% and 41% for NO2 and PM10, respectively’. The living ivy wall also increases biodiversity as it attracts insects, bees, butterflies and birds. Ivy screens help to reduce noise pollution, acting as a vegetative acoustic barrier. Offering an attractive, aesthetic alternative to walls and fencing, turning grey spaces to green. Little maintenance is required with drip line irrigation installed to help the ivy thrive and only yearly pruning needed. If you have a school or building in a polluted area that can benefit from our green screens then contact us. Come and see our latest living wall project at Borough Market. This living wall is part of Better Bankside’s Urban Greening and Placemaking Initiatives which aim to improve the public realm in the local area. The wall helps to reclaim a grey and unused space in the one of the largest and oldest food markets in London, as well as acting as a natural air filter. We removed a section of a living wall that was struggling and added 82 plants to the main wall to give it a new lease of life. The existing plants were covered in dust and pollution particulates which all had to be cleaned. We planted a combination of convolvulus arvensis, erysimum (‘Bowles’s Mauve), liriope muscaris, asplenium scolopendrium, polystichum tsus-simense and alpine flowering plants, including gypsophila and dianthus freynii. These were put in to complement the existing scheme of sarcococca ruscifolia, hedera (ivy) and fatsia japonica. The project challenges included safely carrying out the works at a height of 6m next to a busy pub and in an area with high footfall. We are very pleased by the outcome and looking forward to it thriving in the months ahead. Please contact us for further information on our latest projects. The Meristem team would like to invite you to come and visit our newly installed Parklet, on Calvert Avenue, just off Shoreditch High Street, on the 15th of June. The event will be hosted by Hackney Council as part of the LEN (low emissions neighbourhood) initiative, and will be packed full of other urban greening and sustainable transport ideas. The local event is being hosted as part of National Clean Air Day on the 15th June. Air pollution is real and harms the health of millions. Unlike other risks to our health, lots of people don’t know what causes air pollution, what effects it has on our bodies or how to reduce our exposure to it. But there are lots of simple things we can do to improve air quality and look after our own and other people’s health.That’s what National Clean Air Day is all about. It’s a chance to find out more about air pollution, share information with your friends and colleagues, and take action to make the air cleaner and healthier for everyone.